The Document below provides details about the presentation. that can be incorporated into everyday education. demonstration and a multi‐user timeline application. Chris Richter is a web based interactive software developer from Northern NSW Australia. materials, plugins for platforms, online video and real time online interactive media. file in a browser) used by many European Universities. provided video, audio and real time interaction for students and teachers. Often web based interactive education materials are static or involve complicated Flash based development or high end servers, complicated authentication and expensive software licencing just to allow multi user interaction. As a result of this type of ‘interactive’ materials, so much of a student’s time is spent on their own, working through usually text and image based materials, simple self‐assessment quizzes, Flash interactions and more recently with video based materials. I have spent many years involved in the development of online educational materials, working with teachers, developers, instructional designers and many other very talented educational experts. Often with large budgets and very large organisations involved in the resource development. The end result is some great content with perfectly linked outcomes that if understood and implemented by the student, would qualify them for their chosen certificate or diploma. But the learning that comes from the personal and real interaction with real people in real time is where many of the most valuable lessons can be learnt. I am striving to give teachers the tools and students the experience that will more than just provide them with the theoretical knowledge for their chosen career. This will allow teachers to have contact with their students in real‐time, so they can pass on their personal experience and knowledge in a way that is truly interactive. A typical reason for low online completion results often comes down to motivation. A person doing an exercise or weight loss program is far more successful if they have real contact will real people to motivate and keep them accountable. In the same way, real communication and real time activities with teachers and other students can go a long way to motivate and add accountability to a student’s studies. Sometimes the freedom to study ‘when you want’, ‘in your own time’ also gives you the option to not study when you want in your own time. I would like to demonstrate some basic activities to show how a simple framework can be used to create educational multi‐user real‐time activities. For example, a group of students can work together on a timeline activity in real time or use a photo viewer object to view, annotate, zoom and interact in real time, while discussing with their teacher/lecturer what this all means. 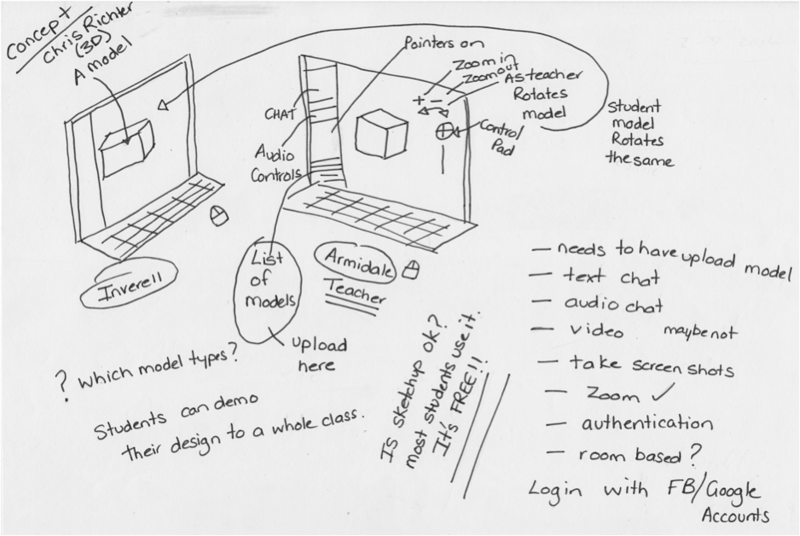 A 3d model can be manipulated by a teacher and discussed in real time where every move on the screen is mirrored to all the students. A real time board game that is not controlled by the computer can bring the realism, arguments, discussion and interaction that a board game would normally give when played in a group instead of turn based computer controlled limitations, often forced onto a user when using a computer based activity. Sit back, listen and enjoy, or better still, logon and be involved in the real time interactions.